Samsung Galaxy S10 line screen sizes, 3.5mm earphone jack "confirmed"
With Samsung's Unpacked 2019 event still three weeks away, we pretty much know the specs for the Samsung Galaxy S10E, Galaxy S10, Galaxy S10+ and the 5G Galaxy S10X. But as you know, nothing is ever written in stone until the phones are introduced. 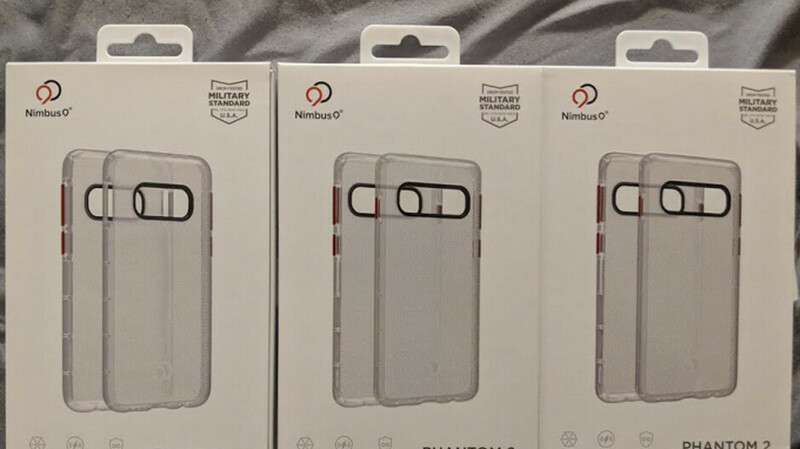 With that in mind, a case manufacturer named Nimbus9 has sent us cases from its clear Phantom 2 line for three of the aforementioned models. As printed on the box for its case, the Samsung Galaxy S10E (S10 Lite it says on the packaging) will feature a 5.8-inch display. The boxes for the Galaxy S10 and Galaxy S10+ list their screen sizes of 6.1-inches and 6.4-inches, respectively. That matches the sizes rumored for the displays on all three handsets. The case for the Galaxy S10E features a cutout for the fingerprint scanner to be mounted on the right side of the phone. The other two phones will feature Qualcomm's ultrasonic in-display fingerprint sensor. The cases for all three models come with a cutout for a 3.5mm headphone jack. We can get a feel for the size of each model based on holding each case. Not surprisingly, the Galaxy S10E feels quite compact, and thanks to the thinner bezels, the Galaxy S10+ will not feel as large as you might think. Not only will it be smaller than the Galaxy Note 9 (even though both have a 6.4-inch display), it is smaller than the Pixel 2 XL with its 6-inch display. 3.5 mm jack. Don’t even miss it at all. Not one bit. Wireless earbuds have come a long way. Bluetooth has come a long way. We don’t really need it anymore. I hope it is fully gone ASAP. If any thing have two ports coming out the phone or a different port than that jack. It’s a dinosaur. You could have a magnetic connection. Really you guys really don’t know what you want till companies like thes phone companies come up with some good ideas. We are The end user. We just need the phone to do what we want. nah ill stick with my wired headphones i really dont want to deal with some yet another thing that has to be charged up every now and then. phone, laptop, watch, headphones, mouse, tablet, blahblahblah america i am officially over it! just give people an option ! We? Speak for yourself and not for everyone else... some of us have already invested on expensive wired headsets, and the fact that Samsung still gives us an option for wired or Bluetooth means their phones is slightly better than the rest. Perhaps we should ask them to remove the microphone as well. Most people text nowadays. I can't remember the last time I called someone. The microphone is archaic and could be replaced with a infrared camera. You guys don't understand what technology can do now. /s To do what I want, I need the headphone jack. It may be a dinosaur, but I bet we could find a use for a dinosaur if we still had them running around. Wired headphones still sound better. As end user, I happy you are not in charge work for Samsung or any company. We are end user, we are the king fool, we are the one with the money. OEM need to know what we want and like not other way around. Business 101. I was using bluetooth earphones long before Apple removed the headphone jack, I still to this day use the 3.5mm jack and for many reasons. Even if you are satisfied with the sound quality to a wireless headphone, there are many other uses for it. Samsung has disproved Apples excuse that removing it makes room for other components, they pack in more in a similar sized phone and charge less. Bluetooth headphones are a great idea, but they do not provide the same sound quality or utility of the 3.5mm jack. Can’t remember last time I use the 3.5 jack. Of course you can’t because you can’t use some that doesn’t have one. @PhoneArena Can you do a size comparison of the S10 Lite case and S9 please? That looks like the side scanner on the E is way at the top. That is a horrible idea. It should be in the middle, like Sony did on the Z5 series. 3.5mm jack can coexist with the bluetooth. What's the problem in 3.5mm jack input? And technically the Bluetooth sound is worse than that of the 3.5mm jack. (nor will I mention the battery in the Bluetooth headset). If audio quality is not important to you, then continue using your Bluetooth.